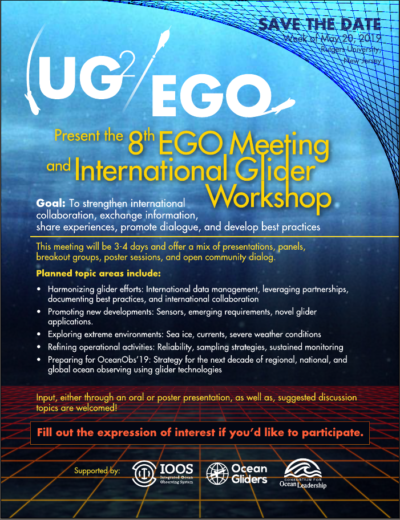 We are pleased to announce an upcoming event: the 8th EGO Meeting and International Glider Workshop scheduled for the week of May 20th, 2019 at Rutgers University, New Jersey. Official event handout attached. The goal of this workshop will be to strengthen international collaboration, exchange information, share experiences, promote dialogue, and develop best practices. This meeting will be 3-4 days and offer a mix of presentations, panels, breakout groups, poster sessions, and open community dialog. Promoting new developments: Sensors, emerging requirements, novel glider applications. Due to high enthusiasm and demand, the deadline for abstract submission has been extended until February 19th at 11:59 p.m. EST. Abstracts can be submitted here. Submission Details: Abstracts will be collected via GoogleForm. Deadline for submission is February 11, 2019.